This method applies the same techniques used by the professional Floor Traders and is based around what a 5 minute bar is indicating at any given time. Set Grab metareader indicators on 5 min and 15 min charts. These are used to assist with determining the strength, weakness or neutrality of the market and which direction to play it. least one full price bar having closed above and sitting on top of the line, this indicates strength, signaling potential upside and possibly a long trade forming. When the price is trading below the the grab lower band line on the 5-minute chart, with at least one full price bar having closed below and fully formed below the line, this indicates weakness, signaling potential downside and possibly a short trade forming. Whenever the price bars trade above the upper line grab indicator or below the lower line grab indicator on the 15-minute chart, this is a stronger confirmation of direction than when on the 5-minute chart. It is important to know this at all times, as you must always trade in the direction of the trend, never against it. Trend direction is mainly determined by reference to the 15minute bar chart and where the price bars are trading in reference to the upper grab line and the lower grab line, as previously explained. may be an obvious trend direction established for the day, but short-term trend changes will inevitably occur and will be indicated by changes in the direction the moving average lines form, either pointing up, down or sideways. what looks like the shape of a mouth, prior to the change. To recognize a good set-up, you must first develop a “feel” for the market and the market flow. 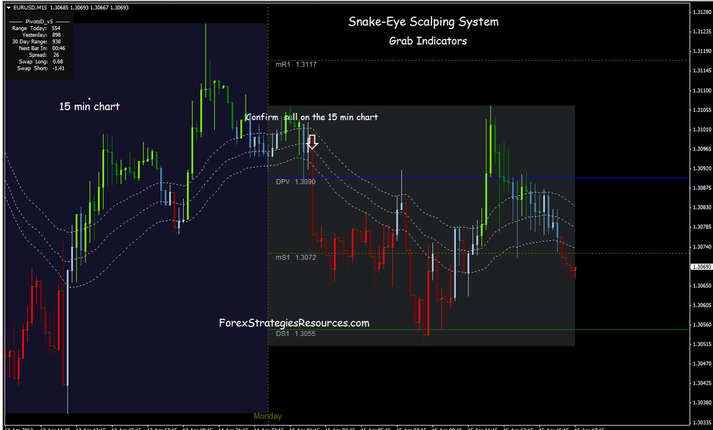 indicators and simply watch the 5-minute bars, their behavior, formations and patterns. Further training is required to accurately and consistently recognize the correct set-ups. However, the principal of the method relies on the current 5-minute bar’s inability to take out the previous bar (or bars) high for a “short” set-up and inability to take out a low in the case of a “long” set–up. With experience and a high degree of concentration in watching the price activity during the formation of the current 5-minute bar, the immediate, short-term direction of the market can be determined with an uncanny accuracy. attempt to take out the high or low of the previous bar (or bars), can provide a clue as to who is in control the buyers or the sellers. failing to get any higher and is unable to take out the immediate, previous highs and then closes, it signals that it has hit resistance at this level and that the buyers are drying up and losing control. If the buyers have dried up, then the path of least resistance is down, as the sellers have now taken over control. This is a time to sell, as prices and the market are going down. The ratio of buyers to sellers is what determines the market direction at any given time. If you see a possible set-up forming, never take your eyes off the bar, or you will miss the message it is giving you…you must watch it very closely. As soon as you have made the decision that it is a set-up, don’t hesitate, don’t wait, get in and take the trade. 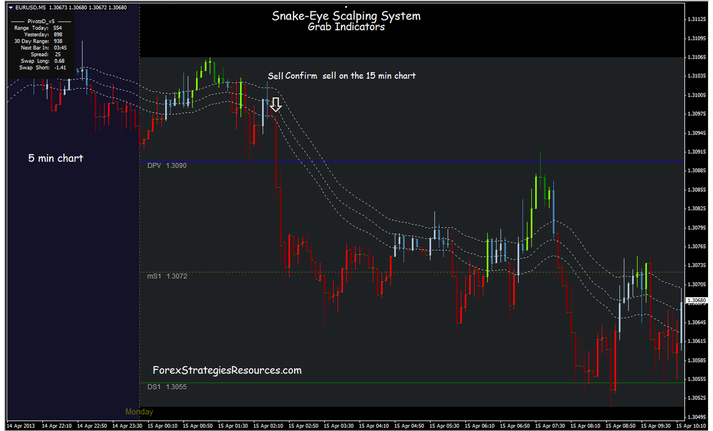 formed, closed and sitting above on top of the line to allow a conservative trade – 2 bars for a more conservative trade. on the 5-minute bar chart, which indicates weakness. At least one price bar must be fully formed, closed and sitting below the line to allow a conservative trade – 2 bars for a more conservative trade. very important for peace of mind and to limit your downside risk. causing you to miss a good run. on the pivot levels or small profits. Chop is a very difficult market to trade and should be avoided as soon as you realize it is in this phase. Never trade a choppy market. Whenever the price bars trade in grab channel without seriously penetrating or staying above or below them, then the market is choppy. The price bars traverse up and down between or a little beyond the two moving averages. market has gone into congestion, just be patient, sit it out and wait for the next trend breakout, it often provides a good move. If you don’t change today – your tomorrows will be like your yesterdays.